Certain American journalists have fostered a myth about John Paul II's role in the fall of Communism. They depict him as a lonely hero in a cold war thriller, a priest who from the start was slipping in and out of darkened doorways in the war against the Evil Empire. At the moment of perfect ripeness, Karol Wojtyla has himself elected Pope, flies home and ignites the fuse he spent years fashioning. If the myth were pitched as a feature film, it would be John Wayne meets John Le Carre. Bits and pieces of the myth are in Malachi Martin's conspiracy-haunted The Keys of the Blood and in Carl Bernstein's controversial account of the Pope and the CIA, His Holiness. But it is nowhere so completely realized, so fully, even encyclopedically documented as in Jonathan Kwitny's Man of the Century. In its preface, he sets out his hero's unwavering path: "Karol Wojtyla, as bishop of Krakow, forged the Solidarity revolution--in his philosophy classes, his community synods, his secret ordination of priests, his clandestine communications seminars, the smuggling network he oversaw throughout the Eastern Bloc...In interviews, colleagues reveal how Wojtyla guided them in a major hunger strike that was the Boston Tea Party of the Solidarity revolution and handed out envelopes of cash to sustain their work. Time and time again, as pope, he single-handedly rescued the revolution he begat." Man of the Century was published in 1997, just as we started the research period for our documentary on John Paul II. It was one of the books we read and reread in preparation for going to Poland. Our consultant, Tad Szulc, urged caution. In researching his own biography of John Paul II, John Paul II, he had not found Kwitny's near perfect arc of engagement from seminary to the free elections that ended Communism in Poland in 1989. We listened to Szulc, who felt there were many forces at work in the end of Soviet rule. But we were still intrigued by Kwitny's model. Our interview list for the "SOLIDARITY" section of the program drew heavily on people in Kwitny's book who described transforming political encounters with Wojtyla. By comparison to most continental writers (who differed slightly from Szulc), we knew Kwitny saw the Pope through an American lens--a rugged individualist, a man of action almost more than a man of the cloth. European journalists, biographers, and writers as different as Timothy Garton Ash, Michael Walsh and Leszek Kolakowski, all saw Wojtyla enmeshed in the Polish Church, lifted on a historic tide sweeping all Catholics, as well as Communists, before it. These observers agreed that although John Paul II's influence as Pope was real and far-reaching, his part as priest in the resistance was much more nuanced than Kwitny claimed. However, since Man of the Century included a massive amount of new investigative reporting, we felt we were tracking the story with the more dramatic cutting edge. It was quickly clear that the story was not going to hold. Time had passed. Some of Kwitny's characters were so old and sick, they simply did not remember what they had said to the former Wall Street Journal reporter. Younger people told us the same stories, but aimlessly, often without the point Kwitny had given them in print. We heard many woolly memories of Wojtyla's protective attitude toward endangered dissidents--but nothing so concrete as Kwitny's account of Wojtyla inspiring the hunger strike. Then we began to find real, disturbing errors of fact. Kwitny identifies Joanna Szczesna, a leading Polish intellectual and an important veteran of the resistance, as Jewish. In truth, she's Catholic. She laughed when we showed her the reference, but she might not have. Given the tortured and explosive history of Catholic-Jewish relations in Poland--the abyss which painfully separates the two worlds--Kwitny's mistake here was a significant error with potential repercussions both personal and professional. Szczesna was also baffled by Kwitny's claim that Wojtyla had "guided" the St. Martin's strike. "We didn't know Wojtyla much then," she said. "He was in Krakow, a world away from us in Warsaw. He was not one of the political priests." But Kwitny insists that he was, backing his assertion with, among other illustrations, a story of how Wojtyla worked hard to persuade Tadeusz Mazowiecki to participate in the strike. Mazowiecki was a Prime Minister after the fall of Communism and is still an official in the Polish government. Tadeusz could not remember speaking with Wojtyla before taking his courageous stand in the church. Mazowiecki was quite skeptical about Wojtyla having any role whatsoever in that action. Our darkest moment came in our final interview with Father Bardeicki, Kwitny's source for Wojtyla's most important clandestine activities. We had interviewed Father Bardeicki at length about the role of the Catholic Church in Polish nationalism, history in the Polish imagination, and the Church's fight against the Communists. This time we asked him outright about Wojtyla's place in the resistance. Had he ever secretly ordained priests in Czechoslovakia? "No, never," Father Bardeicki replied mildly. Had Wojtyla ever sent Father Bardeicki to the Ukraine to gather intelligence on the Church there? "No. I was only in the Ukraine before the war when it was part of Poland. After the lines were redrawn, we were not allowed to go." Did Wojtyla oversee a vast smuggling operation throughout Eastern Europe? "Smuggling Bibles and literature happened," Father Bardeicki assured us. "But it was Wyszynski's operation, Wojtyla was just a parish priest." Of such anti-answers, cold war thrillers are not made. Unfortunately, before we could raise our questions with Jonathan Kwitny, he died of a brain tumor. Because of his sudden, untimely death, he never had the chance to defend the book he'd spent a decade writing. Meanwhile, we were back at ground zero with a critical question--not just about John Paul II's biography, but also about the role of the individual hero in modern history. Though the question has been endlessly debated, it is generally recognized that it is almost impossible to have the same impact of a Columbus or a Martin Luther in one of today's mass societies. When we spoke to Vaclav Havel, the playwright and President of Czechoslovakia, he was cautious about singling out any one person--Gorbachev, Reagan or John Paul II--as the prime mover in the fall of Communism. Havel called the Pope's 1979 pilgrimage to Poland "a miracle" and credited John Paul II's contribution during the trip with being more important than anything the leaders of the U.S. or U.S.S.R. had done. But Havel was also careful to place John Paul II in a historical narrative. In the end, the Pope was only one leading character in the story of a vast grass roots movement. It is a story, we found, that is still being written. Efforts to resist after the war were modest and poorly documented. During the Stalinist terror, people involved in clandestine activities took care to cover their tracks. Those who didn't were murdered. Most of the important memoirs are still to be written. The Catholic records during the period when Wojtyla rose from priest to Cardinal remain under lock and key, and Catholic officials are understandably defensive about the new "political" Pope. The idea of "God's politician" is anathema to the men for whom the Polish Church is a bastion of spiritual power and truth. Its role in the Polish resistance goes back through hundreds of years of humiliations and partitions. We quickly found interviews shutting down when we pressed Poles for testimony about Karol Wojtyla's "political trajectory." Gradually, we learned to ask about his "activism" and all the ways he'd "championed human rights." Even then, we often met reluctance among people who feared their quotes might somehow be used to prove the Pope led a political and not a spiritual revolution. Oddly enough, the surviving Communist record on Wojtyla is one of the best measures we now have of his youthful activism. In 1958, early in Wojtyla's rise, the Communists backed his nomination as auxiliary Archbishop of Krakow. He was known for his intelligence, for being personable and open-minded, a priest who would compromise in the interest of building churches and seminaries. He was not considered radical. The Communists thought he would be manageable malleable, even a poet. For the same reason, Wojtyla was Primate Wyszynski's seventh choice for the job. Once in office, he proved to be innovative, but as far as anyone could tell, not threatening. Lucjan Motyka, who was a Communist leader in Krakow, told us about an extraordinary encounter he had with the young bishop. Wojtyla was upset when authorities requisitioned the diocesan seminary building for use by thestate. He did what no other Catholic bishop had ever done. He went to the Communist Party committee room to speak to Motyka in person. "Wojtyla was not an ideologue. He learned to cross the street. He had great confidence in himself as an actor." His confidence paid off. Motyka negotiated a compromise which limited the state's use of the building to the fourth floor. The rest of the building was left to the seminarians. Motyka was so stunned, he wrote up a detailed report of their meeting and sent it to ten Central Committee members. It was placed prominently in Wojtyla's file--proof that he was "their" man in the Catholic Church. Almost a decade later, when Rome promoted Karol Wojtyla to Cardinal, the Communists had been moved to think of him more critically. In 1967, the UB (Polish secret police) analyzed his strengths and weaknesses in a top-secret document found in their files in the late 80's. "It can be said that Wojtyla is one of the few intellectuals in the Polish Episcopate. He deftly reconciles-- unlike Wyszynski--traditional popular religiosity with intellectual Catholicism...he has not, so far, engaged in open anti-state activity. It seems that politics are his weaker suit; he is over-intellectualized...He lacks organizing and leadership qualities, and this is his weakness in the rivalry with Wyszynski." General Jaruzelski, former head of the Polish Communist Party, laughed ruefully and shook his head at this evaluation during a long, revealing afternoon we spent talking with him. He admitted that one of the great ironies of the regime he served was how much they had underestimated Wojtyla. "My Communist colleagues decided that the Bishops ahead of Karol Wojtyla on the list of candidates were not good for the state, so they pushed Karol Wojtyla. The Holy Spirit works in mysterious ways." Kwitny exaggerated Wojtyla's actual political involvement. He missed the extent to which the revolution within Poland was always a spiritual one-- and that Wojtyla contributed more from the pulpit than from the underground. The Polish Communists underestimated how much Wojtyla's involvement grew-- how, as his consciousness was raised, he shaped his sermons as challenges to the regime. Observers from both East and West failed to appreciate the compelling nature of Wojtyla's leadership, possibly because Primate Wyszynski cast such a huge shadow for so long. These two men came from different generations and backgrounds. Wyszynski was a sociologist; Wojtyla a philosopher. The Primate was popular with the masses; the Bishop of Krakow appealed to youth and intellectuals. Wyszynski and Wojtyla had grown up under different oppressions. During World War II, Wyszynski resisted outwardly. As the chaplain for the outlawed Home Army, he lived underground as a fugitive from the Gestapo. Wojtyla's resistance was more inward. He fought first with the word in the Rhapsodic Theatre and then with prayer and study in Sapieha's secret seminary. The lean, wolf-faced Wyszynski had the tough negotiating skills to deal with the Stalinists. He fought openly for the Catholic Church and was imprisoned for his outspokenness. As Wojtyla came of age in the Church of the late 50's, early 60's, Neal Ascherson told us that it was apparent that the Communist threat was shifting from terror to the gray numbing of spirit. Wojtyla's generation could see the end of brute force. They faced the lies that replaced it by trying to find strategies for living in truth. As a young priest, Wojtyla was not confrontational. He was always known as a good listener. He was eclectic, ready to make alliances with outsiders to the Church--leftists, the intelligentsia, even Jews. From early on, he cultivated small groups and often had a transforming effect on the participants. The young people who hiked and canoed with Wojtyla all during the 50's experienced a freedom that was unheard of in other areas of Communist society. Wojtyla encouraged arguments about politics, religion, even relationships. People could let down their guards in the "zones of freedom" that Wojtyla created around himself. They developed unusual bonds with each other; literally, the 'solidarity' which made possible the later revolution and became the name of the trade union that led it. Wojtyla encouraged other small discussion groups, ones that met in church basements, along with the "flying universities" whose classes met wherever there were vacant pews. Bronislaw Sonik, a future leader of KOR (Committee for the Defense of Workers) remembers hearing Wojtyla lecturing his friends in the Dominican students' group: "The Church was the only place where you could meet and feel free and independent. Wojtyla's reflections on how to be young and faithful but also politically active in those dangerous times impressed all of us. When our activities became much more illegal and the authorities started to arrest our colleagues, we used to visit Wojtyla late at night in his palace. He sustained us." The transformation did not just run from Wojtyla to the students. Over time, Wojtyla was changed as much as those whose lives he altered so dramatically. For decades, for instance, he was the advisor to Tygodnik Powszechny, a free-thinking Catholic weekly in which Wojtyla at first had no real interest. But gradually, as one of the editors, Krystoff Kozlowski, told us, Wojtyla changed. "He was afraid of politics...He would say, 'I don't want to talk about politics.' But it was very difficult not to talk about politics...Everything is political in a totalitarian state...After several years, Wojtyla stopped protesting. He listened as we talked and argued, and he would sort out the mail, and then in the 70's he started to talk. He said, in fact, that he realized you can't live in Poland without politics." Jerzy Wozniakowski, the eminent art critic and close friend of the Pope's, also remembers Wojtyla's transformation. "He was a man who even hated to read the papers, whom we had to persuade that it was important to know what was going on. But once he started to pay attention he was the quickest study. I never met anyone who learned so quickly." The struggle to build the Nowa Huta church is one of the great clashes between the Catholic Church and Communists in post-war Poland. Of all the conflicts between the Church and the Communists involving Karol Wojtyla, this story perfectly expresses his growth into political leadership. It is a small gem of a story, multifaceted, twenty years in the making, combining all the elements of Wojtyla's own political journey--both prosaic and dramatic, gradual and surprising. Ultimately, this story is revealing of the man, the priest, the emerging leader who understood the importance of tenacity and compromise, as well as the great communicator who is exquisitely aware of symbolism and timing. Nowa Huta was a brand new town built by the Communists in the early 50's outside of Krakow. The town was in Wojtyla's jurisdiction. It was meant to be a workers' paradise, built on Communist principles, a visible rebuke to the "decadent," spiritually besotted Krakow. The regime assumed that the workers, of course, would be atheists, so the town would be built without a church. But the people soon made it clear they did want one. Wojtyla communicated their desire, and the regime opposed it. The conflict became an intense symbol of the opposition between the Catholic Church and the Communist state. It was a conflict between the workers' world that was supposed to be beyond religion--and the actual workers singing old Polish hymns that started with the words, "We want God." The Communist Party reluctantly issued a permit in 1958 and then withdrew it in 1962. Years went by as Karol Wojtyla joined other priests--especially, Father Gorlaney--met with authorities,and patiently filed and refiled for building permits. Crosses were put in the designated area and then pulled down at night only to mysteriously reappear weeks later. Meanwhile, Bishop Wojtyla and other priests gave sermons in the open field, winter and summer, under a burning sun, in freezing rain and snow. Year after year, Bishop Wojtyla celebrated Christmas Mass at the site where the church was supposed to be built. Thousands peacefully lined up for communion, but tension was building. Violence did actually erupt when the Communist authorities sent a bulldozer to tear down the cross. Lucjan Motyka was roused out of his hospital bed to be jeered at by the demonstrators. As he reminisced with us one morning about this humiliating moment, Motyka clearly believed that it was Wojtyla's calming words that helped to avert an ugly and potentially dangerous confrontation. By this time, the Communists, local leaders, residents and Catholic Church had dug in, their positions seemingly intractable. The Communists' compromise to allow a church to be built outside of the town was rejected--until Karol Wojtyla, the realist, the negotiator, broke the stalemate,persuading everyone that the existence of the church transcended all other considerations. The time to bend was now. 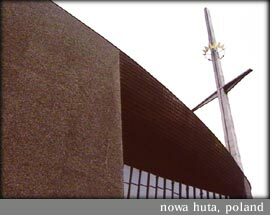 In May 1977, a year before he became Pope, almost twenty years after the first request for a permit, Karol Wojtyla consecrated the church at Nowa Huta. What the worshippers were most proud of--and it was a symbol Karol Wojtyla helped to make into a reality--is the gigantic crucifixion that hangs over the new altar. It was made out of shrapnel that had been taken from the wounds of Polish soldiers, collected and sent from all over the country to make the sculpture in the new church. Along with his steady mastery of red tape and showing up (again and again and again), Wojtyla's gifts as public speaker matured during the 70's. They were on daily display during his years in Krakow whenever he gave sermons or led a procession through the streets celebrating one of the many Catholic feast days. During partition, long decades when the Poles could not speak freely, they learned the survival tactic of Aesopian double speak. People spoke of "Christ's crucifixion" and meant their own; they spoke of "freedom under God" and meant release from their oppressors. Wojtyla knew this subversive habit well, and he practiced artful symbolic dodge every Sunday at St. Florian's, his church in Krakow. When the cardinal spoke of "truth in everyday life" the congregation knew he meant both "Christ's truth" and the plain truth: all that wasn't a Communist lie. It was not a call to revolution, but it was a little expression of everyone's anger toward the regime, a little reminder that everyone clearly knew the difference between honesty and falsehood. As prosaic as this might seem in our outrageously expressive democracy, Wojtyla's words drew new people -- even those who weren't religious came to church as a way of casting their silent vote against the regime. The Communists began to blunder crudely. In the late 70's, there were bloody clashes between workers and police after the government again raised food prices. Five priests disappeared in a short period of time. The police killed a popular student leader. Wojtyla became more and more outspoken, calling openly and concretely for the "right to freedom...an atmosphere of genuine freedom untrammeled...unthreatened; an atmosphere of inner freedom, of freedom from fearing what may befall me if I act this way or go to that place." As a young man, Father Zieba was in the student opposition before he joined the Dominican order. He saw the student leader's death transform Wojtyla. "It focused him. That's when he stepped out from behind Wyszynski and started to make his official first statements." For the young Zieba, "the homilies during this period were so beautiful and moving that we typed them up and passed them around." Father Bardeicki told us another story which powerfully suggests not only how visible Wojtyla was in those years, but also how well he knew it. Father Bardeicki decide to run an abbreviated account of a meeting between Polish Party Secretary Edward Gierek and Pope Paul VI in Rome. The Communists accused Wojtyla, as Tygodnik Powszechny's advisor, of censorship. People were outraged. The editorial staff gathered at the Archbishop's palace to discuss the situation. On the way home, Father Bardeicki was very badly beaten: he lost teeth; his nose was broken; if his attackers hadn't been surprised and fled, he might have been killed. When Wojtyla saw his injured, bandaged friend, he was silent for a moment. Then the Cardinal said, "You got that for me." From the first day of his election, John Paul II's pontificate raised concern in Central Committee headquarters. The Canadian reporter, Eric Margolis, described it this way: "I was the first Western journalist inside the KGB headquarters in 1990. The generals told me that the Vatican and the Pope above all was regarded as their number one, most dangerous enemy in the world." Soon enough, people of all sorts--world leaders, clandestine dissidents and ordinary Catholics--sensed the Communists were impotent before the Polish Pope. In 1979, when John Paul II's plane landed at Okecie Airport, church bells ran throughout the country. He criss-crossed his beloved Poland, deluged by adoring crowds. He preached thirty-two sermons in nine days. Bogdan Szajkowski said it was, "A psychological earthquake, an opportunity for mass political catharsis..." The Poles who turned out by the millions looked around and saw they were not alone. They were a powerful multitude. The Pope spoke of human dignity, the right to religious freedom and a revolution of the spirit--not insurrection. The people listened. As George Wiegel observed, "It was a lesson in dignity, a national plebiscite, Poland's second baptism." Our images of revolution are filled with blood-stained pictures: French aristocrats lined up against the Bastille wall; the Tsar's family executed in a cellar under cover of night; Mao's victims floating down the Yellow River. The romantic collective Polish psyche brims with images of violent, quixotic rebellions. They range from the futile uprisings of the 19th century to the calvary charging German tanks on horseback at the beginning of World War II. But the revolution launched by John Paul's return to Poland is one that conjures roads lined with weeping pilgrims, meadows of peaceful souls singing hymns, and most of all, of people swaying forward as one--reaching for the extraordinary man in white as he is borne through their midst. "What is the greatest, most unexpected event of the 20th century?" James Carroll asked in his interview with us. "Isn't it that the Soviet Empire was brought down non-violently? Isn't John Paul II's story part of it?" Again and again, people told us that it was. John Paul II's 1979 trip was the fulcrum of revolution which led to the collapse of Communism. Timothy Garton Ash put it this way, "Without the Pope, no Solidarity. Without Solidarity, no Gorbachev. Without Gorbachev, no fall of Communism." (In fact, Gorbachev himself gave the Kremlin's long-term enemy this due, "It would have been impossible without the Pope.") It was not just the Pope's hagiographers who told us that his first pilgrimage was the turning point. Skeptics who felt Wojtyla was never a part of the resistance said everything changed as John Paul II brought his message across country to the Poles. 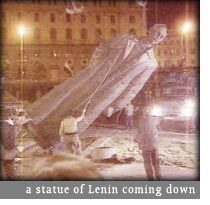 And revolutionaries, jealous of their own, also look to the trip as the beginning of the end of Soviet rule. It took time; it took the Pope's support from Rome--some of it financial; it took several more trips in 1983 and 1987. But the flame was lit. It would smolder and flicker before it burned from one end of Poland to the other. Millions of people spread the revolution, but it began with the Pope's trip home in 1979. As General Jaruzelski said, "That was the detonator." biography | anecdotes | his poems | "abba pater" | encyclicals | video excerpt | tapes & transcripts | synopsis | press | "abba pater"